This flooring nailer gives you the flexibility to switch between the two most popular flooring fasteners without having to carry around two separate tools. Designed to stand up to the rigors of everyday use, it is built with a hardened steel drive blade, rubber O-rings, and an aluminum body. This nailer installs most 5/8 inch to > inch solid tongue and groove flooring, and comes with interchangeable base plates. The no-mar base makes it safe to use on prefinished or unfinished flooring. This nailer is compatible with 16-gauge L-cleats from 1-1/2 inch to 2 inch long and 15-1/2 gauge 1/2 inch Crown Flooring Staples from 1-1/2 inch to 2 inch long. The lightweight fibreglass mallet's white rubber head prevents marring when you move your flooring into place and the tool-free quick release makes it easy get back to work quickly after a jam. The 1/4 inch NPT swivel fitting rotates 3600, and the air filter and anti-dust cap keep the tool's interior clean. Each nailer comes with a padded bag. 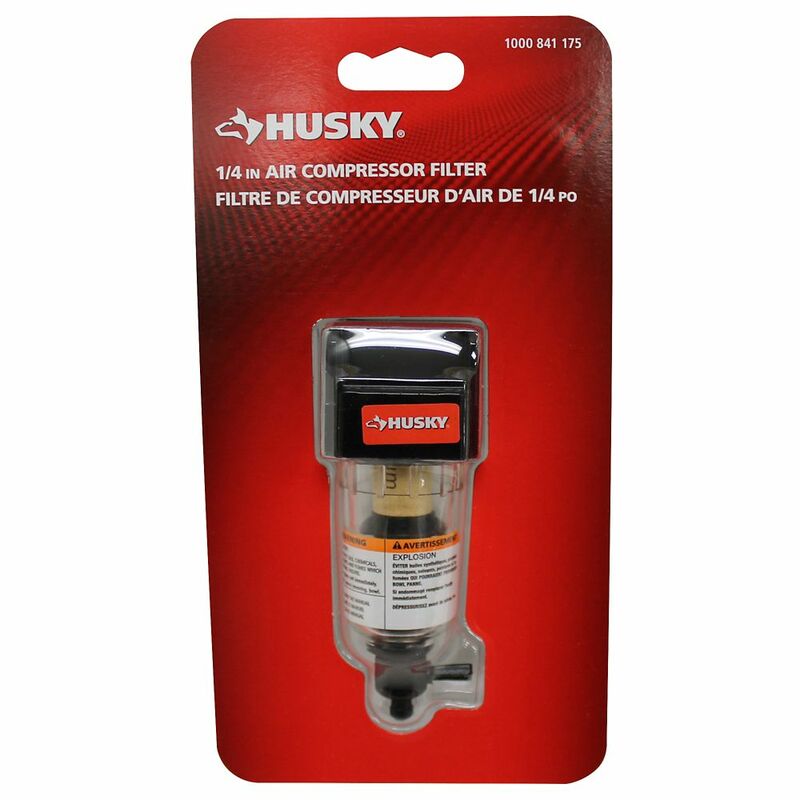 1/4 Inch Air Compressor Filter The Husky 1/4 inch Air Compressor Filter is designed to remove unwanted dirt larger than 5 microns and condensed water from air compressor hoses. This may include dust, dirt, pipe scale, rust, liquid water, and oil. The filter has a 1/4 inch female NPT port and has a flow capacity of 21 SCFM at 90 psi. The bowl screws on top of the clear filter and drains manually.